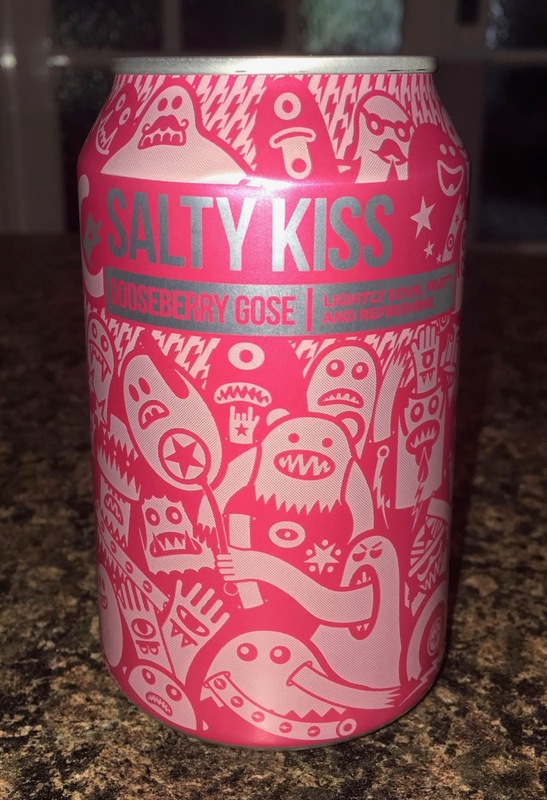 This Salty Kiss from the Magic Rock brewery, in Huddersfield, is a Gose beer with gooseberry added in the brewing. A Gose is a German style top fermented sour wheat beer, and this one is made with Bavarian Pils. I haven't liked some of the sour beers I've tried in the past, but I don't believe I have tried a Gose. I have enjoyed gooseberry beer, so that's a plus, but this 4.1% volume Salty Kiss also had Sea Buckthorn or Seaberries added in the brewing, as well as salt. Apparently Sea Buckthorn is used as a cure-all in some parts of Russia and Eastern Asia, which could be a bonus for any ills I'm fighting off from swallowing half of the gym's outdoor pool earlier! On opening the can there was indeed a sour aroma to the wheat beer inside. There was also saltiness at the back of the smell. On taste there is definitely a strong gooseberry flavour to begin with that merges well with the wheat and added citrus kick from the pilsner. There follows an extra bite of sour fruit I took to be the Sea Buckthorn and a saltiness into the aftertaste. It does say "lightly sour, fruity and refreshing" on the can. I definitely agree the with two later words in the description, but I'd say "lightly sour" is an underestimation. However, this is a tasty and unusual beer. If you want something different and off the usual, if not wobbly, beer trail this could be for you.